William Safire, a speechwriter for US president Richard M. Nixon and a Pulitzer Prize-winning political columnist for The New York Times (NYT) who also wrote novels, books on politics and a Malaprop’s treasury of articles on language, died at a hospice in Rockville, Maryland, on Sunday. He was 79. The cause was pancreatic cancer, said Martin Tolchin, a friend of the family. There may be many sides in a genteel debate, but in the Safire world of politics and journalism it was simpler: There was his own unambiguous wit and wisdom on the one hand, and on the other, the blubber of fools he called “nattering nabobs of negativism" and “hopeless, hysterical hypochondriacs of history". Then, from 1973 to 2005, Safire wrote his twice-weekly Essay for the op-ed page of The Times, a forceful conservative voice in the liberal chorus. Unlike most Washington columnists who offer judgements with Olympian detachment, Safire was a pugnacious contrarian who did much of his own reporting, called people liars in print and laced his opinions with outrageous wordplay. 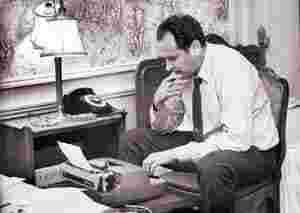 Critics initially dismissed him as an apologist for the disgraced Nixon coterie. But he won the 1978 Pulitzer Prize for commentary, and for 32 years tenaciously attacked and defended foreign and domestic policies, and the foibles, of seven administrations. Along the way, he incurred enmity and admiration, and made a lot of powerful people squirm. Safire also wrote four novels, including Full Disclosure (Doubleday, 1977), a best-seller about succession issues after a president is blinded in an assassination attempt, and nonfiction that included The New Language of Politics (Random House, 1968), and Before the Fall (Doubleday, 1975), a memoir of his White House years. And from 1979 until earlier this month, he wrote On Language, an NYT Magazine column that explored written and oral trends, plumbed the origins and meanings of words and phrases, and drew a devoted following. The columns, many collected in books, made him an unofficial arbiter of usage and one of the most widely read writers on language. It also tapped into the lighter side of the dour-looking Safire: a Pickwickian quibbler who gleefully pounced on gaffes, inexactitudes, neologisms, misnomers, solecisms and perversely peccant puns, like “the president’s populism" and “the first lady’s momulism", written during the Carter presidency. There were columns on blogosphere blargon, tarnation-heck euphemisms, dastardly subjunctives and even Barack and Michelle Obama’s fist bumps. And there were Safire “rules for writers": Remember to never split an infinitive. Take the bull by the hand and avoid mixing metaphors. Proofread carefully to see if you words out. Avoid cliches like the plague. And don’t overuse exclamation marks!! Behind the fun, readers said, was a talented linguist with an addiction to alliterative allusions. There was a consensus, too, that his op-ed essays, mostly written in Washington and syndicated in hundreds of newspapers, were the work of a sophisticated analyst with voluminous contacts and insights into the way things worked in Washington. Safire called himself a pundit—the word, with its implication of self-appointed expertise, might have been coined for him—and his politics “libertarian conservative", which he defined as individual freedom and minimal government. He denounced the Bush administration’s USA Patriot Act as an intrusion on civil liberties, for example, but supported the war in Iraq. He was hardly the image of a button-down Times man: The shoes needed a shine, the grey hair a trim. Back in the days of suits, his jacket was rumpled, the shirt collar open, the tie askew. He was tall, but bent—a man walking into the wind. He slouched and banged a keyboard, talked as fast as any newyawka and looked a bit gloomy, like a man with a toothache coming on. His last op-ed column was Never Retire. He then became chairman of the Dana Foundation, which supports research in neuroscience, immunology and brain disorders. In 2005, he testified at a Senate hearing in favour of a law to shield reporters from prosecutors’ demands to disclose sources and other information. In 2006, he received the Presidential Medal of Freedom from president George W. Bush. From 1995 to 2004, he was a member of the board that awards the Pulitzer Prizes.